I haven’t update this website for a very very long time due to my life as engineer and I don’t have time to do so. And recently I bought a NAS for my home network. It replace my old pentium 3 PC as the torrent PC and also able to stream UPNP compatible media. So what is NAS? NAS is a small storage server system that is connected to your PC through network. Basically, it is a headless (no monitor) system that is configurable using browser. File transfer is done using share folder or network mapped drive letter. A NAS can do a lot of things but mostly it is used as file server, media server, torrent client and streaming server. This brand new RM439 DNS-323 can be used as above but for my purpose, I want to turn it as a torrent PC, media server and of course storage system. It has 2 drive bay and users are able to slot in 2 SATA hard disk into it. DNS-323 support up to 2TB hard disk capacity through it’s latest firmware 1.08. DNS-323 has a 500Mhz Marvell ARM Processor and 64MB RAM. Basically it has an average processing power of Pentium 3 PC but severely lack in mathematical process but not that we want to use it in that capacity. 64MB RAM is not too much to play around but should be sufficient for its role. DNS-323 also able to support USB printer and USB external storage using its Shareport ability (though I didn’t use it). DNS-323 is very easy to install. Use both hand and push the face plate up. It will disengage with a click and pull it toward you gently. The drive bay can fit standard 1 inch thick 3.5″ SATA drive so most of the 1TB, 2TB and 1.5TB can fit nicely. For drive with lower capacity or less amount of disk platter, they usually has less thickness. Use the included springy cardboard to fit the in the gap and make it snug. Make sure you have the correct facing so the pin will fit by comparing both the bay and the drive pin. After that, attach the face plate by pushing it from in front about one third making sure it slot in the locking mechanism and then push it down. 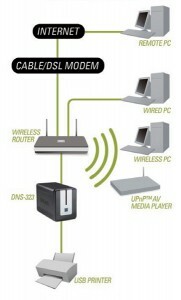 Plug in the power and the network cable and turn it on by pressing the square “dlink”. A blue LED will lit around the switch and on the HDD icon and the network icon to show it is working fine. If the HDD icon turn to amber, it means there is something wrong with your hard disk. Check your connection. The switch LED will flicker or blink to indicate that it is starting up. When it turn to constant lit, the DNS-323 has completed its loading. You can now point your browser to the DNS-323 ip. Refer the manual on how to do this. The IP might be different from default if you has a DHCP server on your network. You’re recommended to run the Easysearch utility for easy connection. DNS-323 has a FTP server, bit torrent and iTunes server built in. But the bit torrent client that come with it is very lacking in functionality. It doesn’t have encryption (This is very important in order to bypass throttling), slow download and cannot move its downloaded file to a new location. I haven’t test the iTunes server but the FTP server used is Pure FTP. The latest firmware update add plug in functionality and allow torrent plugin and firelfly to be run. I do some research on how to hack the dns-323 and there are 2 ‘easy’ way to do this. The hard way require JTAG/serial installation but allow the DNS-323 to run linux natively bypassing its firmware completely. I might do this in the future provided I have the time. The 2 easy ways to run your favourite linux software on the DNS-323 are fun plug and chroot debian. Fun plug is like an extension to the built in linux and allow software to be run with limited dependencies. The only con of this is that the the software must be compiled and tailored for the fun plug. Fun plug is simple to use and to install but it may not be suitable for people who are familiar with linux. Chroot debian is basically ‘linux in linux’. It is like running a windows xp in windows xp again. Like fun_plug, it cannot harm your shiny DNS-323 if you mess up as the original firmware or built in linux is not touched at all. Chroot debian allows more flexibility such as giving you ability to compile software straight using DNS-323 without depending on a host enviroment ( you have to compile on other linux PC before you can run it on DNS-323). Chroot also allow more control as everything is the same as a linux PC. The only things you have to watch out are the library path which can be rectified easily using export command. I’ll detail the installation of chroot and transmission bt and mediatomb in my next post. I like this web blog very much, Its a real nice spot to read and receive information.